1. Addressing Threats to Water Quality in Suan Phung Nature Education Park: Ratchaburi, Thailand, 2005, An Interactive Qualifying Project Report submitted to the faculty of Worcester Polytechnic Institute, sponsored by The Office of HRH Princess Maha Chakri Sirintorn’s Projects, Bureau of the Royal Household. 2. The effect of water quality on contamination of heavy metals in fish and mussels in region of inner gulf of Thailand, 2003, Research Report supported by the Thai Government Research Fund, Thai Government Budget. 1. Wongkaew, M.; Imyim, A.; Eamchan, P. “Extraction of heavy metal ions from leachate of cement-based stabilized waste using purpurin functionalized resin”, Journal of Hazardous Materials, 2008, 154(1-3), 739-747. 2. Ngamcharussrivichai, C.; Imyim, A.; Li, X.; Fujimoto, K. “Active and Selective Bifunctional Catalyst for Gasoline Production through a Slurry-Phase Fischer-Tropsch Synthesis”, Industrial & Engineering Chemistry Research, 2007, 46(21), 6883-6890. 3. Meesri, S.; Praphairaksit, N.; Imyim, A. “Extraction and preconcentration of toxic metal ions from aqueous solution using benzothiazole-based chelating resins”, Microchemical Journal, 2007, 87(1), 47-55. 4. Manutsewee, N; Aeungmaitrepirom, W.; Varanusupakul, P.; Imyim, A. “Determination of Cd, Cu, and Zn in fish and mussel by AAS after ultrasound-assisted acid leaching extraction”, Food Chemistry, 2007, 101(2), 817-824. 5. Daorattanachai, P.; Unob F.; Imyim, A. “Multi-element preconcentration of heavy metal ions from aqueous solution by APDC impregnated activated carbon”, Talanta, 2005, 67(1), 59-64. 6. Imyim, A.; Deechangvipart, S.; Tuntulani, T. “Liquid extraction of zinc and nickel ions using a cryptand-like calixarene derivative”, The Journal of Scientific Research Chulalongkorn University, 2005, 30(1), 41-49. 7. Tiruta-Barna, L.; Imyim, A.; Barna, R. "Long-term prediction of the leaching behavior of pollutants from solidified wastes", Advances in Environmental Research, 2004, 8(3-4), 697-711. 8. Barna, R.; Rethy, Z.; Imyim, A.; Perrodin, Y.; Moszkowicz, P.; Tiruta-Barna, L. "Environmental behaviour of a construction made of a mixture of hydraulic binders and air pollution control residues from municipal solid waste incineration Part 1. Physico-chemical characterisation and modelling of the source term" Waste Management, 2000, 20(8), 741-750. 9. Imyim, A.; Tiruta-Barna, L.; Barna, R.; Méhu, J. “Prediction of inorganic pollutant release from various cement based materials in disposa/utilisation scenario based on the application of a multi-parameter leaching tool box” Waste Management Series, 2000, 1, 318-324. 10. Imyim, A.; Moszkowicz, P.; Tiruta-Barna, L. et al. “Mise au point d’une boite a outils de tests de lixiviation pour l’evaluation du flux de polluants emis d’un dechet solide”, Dechet Sciences et Techniques, 2000, 18, 15-23. 1. 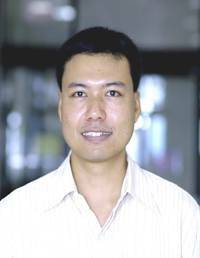 Thanacharuphamorn, C.; Unob, F.; Imyim, A. “Removal of heavy metal ions from wastewater using humic acids immobilized on silica” In Pure and Applied Chemistry International Conference (PACCON), 29 January-1 February 2008, Bangkok, Thailand, p. 336. 2. Prapalimrungsi, E.; Imyim, A. “Removal of humic acids from water by rice husk ash” In The 33rd Congress on Science and Technology of Thailand, 18-20 October 2007, Walailak University, Nakhon Si Thammarat, Thailand. 3. Hemvasdukij, S.; Imyim, A. “Synthesis of humic acids grafted poly(N-isopropylacrylamide)” In The 33rd Congress on Science and Technology of Thailand, 18-20 October 2007, Walailak University, Nakhon Si Thammarat, Thailand. 4. Wongkaew, M.; Imyim, A.; Eamchan, P. “Synthesis of Amberlite XAD-2 functionalized with purpurin for extraction of heavy metal ions in leachate from cement-based stabilized waste” In The 33rd Congress on Science and Technology of Thailand, 18-20 October 2007, Walailak University, Nakhon Si Thammarat, Thailand. 5. Sirikanjanawanit, N.; Ngeontae, W.; Sukpirom, N.; Imyim, A.; Praphairaksit, N. “Reductive characteristics of amido-amidoxime functionalized silica for preparation of nanogold” In The 33rd Congress on Science and Technology of Thailand, 18-20 October 2007, Walailak University, Nakhon Si Thammarat, Thailand. 6. Lertlapwasin, R.; Fuangswasdi, S.; Imyim, A. “Extraction of Ni(II) ion by 2-amino-thiophenol in room temperature ionic liquid” In The 33rd Congress on Science and Technology of Thailand, 18-20 October 2007, Walailak University, Nakhon Si Thammarat, Thailand. 7. Ngamcharussrivichai, C., Imyim, A.; Li, X., and Fujimoto, K. “An Active and Selective Bifunctional Catalyst for Gasoline Production through a Slurry-phase Fischer-Tropsch Synthesis” In 10th Asian Conference on Fluidized-bed and Three-phase Reactors, 26-29 November 2006, Busan, Korea. 8. Nutthanara, P., Imyim, A., Kreethadumrongdat, T. and Ngeontae, W. “Cyclic dithia/diaza contained polymers with dual Schiff base linkage for heavy metals extraction” In 2nd Mathematics and Physical Sciences Graduate Congress (MPSGC), 12-14 December 2006, Singapore. 9. Imyim, A.; Meesri, S.; Praphairaksit, N. “Extraction of Cd(II), Cu(II), and Pb(II) in water by benzothiazole-based resin”, In International Congress on Analytical Sciences (ICAS-2006), 25-30 June 2006, Moscow, Russia. 10. Nutthanara, P.; Ngeontae, W.; Kreethadumrongdat, T.; Imyim, A. “Synthesis of chelating polymer containing Schiff base and sulfur and adsorption properties for heavy metals” In The 32nd Congress on Science and Technology of Thailand, 10-12 October 2006, Queen Sirikit National Convention Center, Bangkok, Thailand, p.242. 11. Passako, A; Imyim, A. “Influence of humic acids on solubilisation of heavy metals from cement-based stabilised contaminated soil” In The 32nd Congress on Science and Technology of Thailand, 10-12 October 2006, Queen Sirikit National Convention Center, Bangkok, Thailand. 12. Meesri, S; Praphiraksit, N.; Imyim, A. “Extraction of Copper (II) ion in water by polystyrene divinylbenzene containing benzothiazole” In The 31st Congress on Science and Technology of Thailand, 18-20 October 2005, Nakorn Ratchasima, Thailand, p.151. 13. Ngeontae, W., Imyim, A., Sukpirom, N., and Aeungmaitrepirom, W. “Sunthesis and characterization of chemically modified silica for nanogold preparation” In The 31st Congress on Science and Technology of Thailand, 18-20 October 2005, Nakorn Ratchasima, Thailand, p.147. 14. Lertlapwasin, R., Promprakai, K., and Imyim, A. “Extraction of heavy metals from used lubricating oil using humic acids solution” In The 31st Congress on Science and Technology of Thailand, 18-20 October 2005, Nakorn Ratchasima, Thailand, p.301. 15. Wongkeaw, M.; Tumniyom, S.; Emchan, P.; Imyim, A. “Solid phase extraction of Copper (II) ion from aqueous solution by amberlite-xad 2 containing purpurin” In The 31st Congress on Science and Technology of Thailand, 18-20 October 2005, Nakorn Ratchasima, Thailand, p.151. 16. Daorattanachai, P; Unob, F.; Imyim, A. “Preconcentration technique using activated carbon for determination of metals in fish”. In The 30th Congress on Science and Technology of Thailand, 19-21 October 2004, Nonthaburi, Thailand, p.108. 17. Kittisuwannakul, P.; Morakot, N.; Ngeon-tae, W.; Imyim, A., “Preparation of Benzothiazole Derivative Based Chelating Resin”. In The 30th Congress on Science and Technology of Thailand, 19-21 October 2004, Nonthaburi, Thailand, p.170. 18. Imyim, A.; Tiruta-Barna, L.; Barna, R.; Mehu, J. “Prediction of inorganic pollutant release from various cement based materials in disposal/utilisation scenario based on the application of multi-parameter leaching tool box”. In Waste Materials in Construction: WASCON 2000, Harrogate, England, Edited by G.R. Woolley, J.J.J.M. Goumans, P.J. Wainwright, Oxford: Elesevier, 2000, 318-324. 19. Tiruta-Barna,L. ; Imyim, A.; Barna, R.; Mehu, J. “Reuse of cement-based S/S MSWI fly ash for landfill disposal: Modelling for long term environmental impact prediction”. In Suitanable Construction: Use of incinerator ash, Edited by Dhir R.K., Dyer T.D., Paine K.A., London:Thomas Telford Publishing, 2000, 437-446. 1. อภิชาติ อิ่มยิ้ม และ ภาคภูมิ รุ่งเรือง “การละลายของแคดเมียมจากก้อนซีเมนต์”, วารสารวิศวกรรมสิ่งแวดล้อมไทย, 2546, 18(2), 101-111. 2. วราภรณ์ ศรีมูล, วิไลวรรณ อุทุมพฤกษ์พร, สราวุธ รัตนจงเกียรติ และ อภิชาติ อิ่มยิ้ม. “การพัฒนาการวิเคราะห์รูปแบบทางเคมีของอาร์เซนิกในปลาด้วยวิธี HPLC/ICP-OES”, วารสารวิจัยวิทยาศาสตร์ (SectionT), 2548, 4(3), 189-202. 3. ประดิษฐ์ ณัฏฐานารา และ อภิชาติ อิ่มยิ้ม. “การเตรียมตัวอย่างเพื่อหาปริมาณดีบุกในเนื้อปลาด้วย GFAAS”, วารสารศูนย์เครื่องมือวิจัยวิทยาศาสตร์และเทคโนโลยี, 2549, 14(1), 58-68. 4. มาริสา วงษ์แก้ว พนวสันต์ เอี่ยมจันทน์ และ อภิชาติ อิ่มยิ้ม. “การหาลักษณะเฉพาะของแอมเบอร์ไลท์เอ็กซ์เอดี-2 ที่มีหมู่ฟังก์ชันเพอร์พูรินด้วยเทคนิคอินฟราเรดและรามานสเปกโทรสโกปี”, วารสารศูนย์เครื่องมือวิจัยวิทยาศาสตร์และเทคโนโลยี, 2550, 15(1), 47-55.